John is the founder and owner of Ahdoot Oriental Rugs, located in Midtown, Manhattan. He sat down for a brief interview to tell us about his favorite rug he's owned, an important rug he repaired, and what it is he loves about Oriental rugs. How did you come to found Ahdoot Oriental Rugs? I came here when I was 17, in 1970, and I got my BA at Brooklyn College in Computer Science and Math. I don’t know computers anymore, back then they were these big machines that took up an entire room. But I had a brother working with rugs, and so less than two years out of college I started Ahdoot Rugs in 1976. It wasn’t until 1984 that I turned it into a corporation, which is the same year I got my citizenship. What is your favorite part of working with rugs? Either repairing antique rugs—especially family heirlooms—or appraising rugs, because of the history involved. Is there a particular rug you’ve repaired you were most proud of? There was this one rug, a Serapi, which I repaired completely. It was beautiful, but had been worn and damaged down to shreds. There was a flood that destroyed a large section, a vase was sitting on it and the water from it completely disintegrated a 3x3 section. The whole thing was in tatters, and I repaired it back to its original condition. What about a rug you’ve appraised? Yes, there was a special rug that someone asked me to appraise for them. When I appraise a rug, I’m not giving the owner the wholesale price, what it would cost to re-buy the rug, but the replacement value. If a rug has a history, it’s often worth a lot more. So a family asked me to appraise a rug and it turned out that it used to be in the house of President Roosevelt. They were wanting to sell it to make some quick money, but after I gave them the replacement value, they decided not to sell it, and instead, to pass it down through generations as a family heirloom. 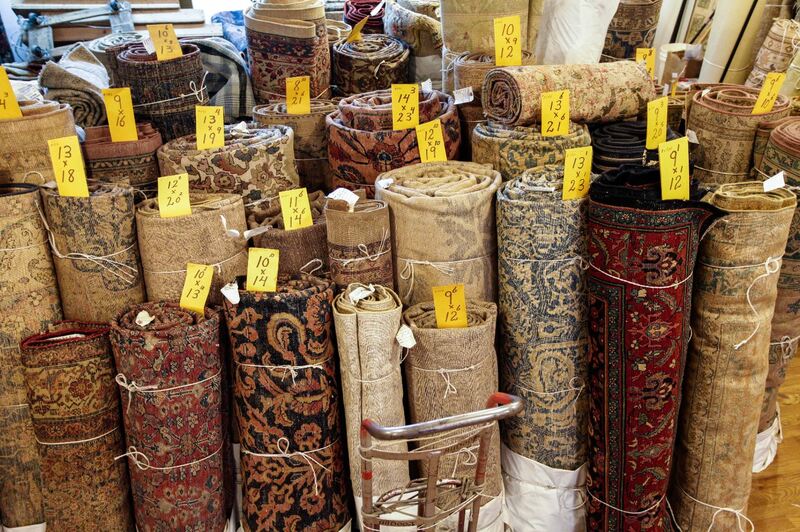 Do you collect rugs yourself? Do you have a favorite? I do, but mostly I like to collect Coptic textiles, which were made by Christians in Egypt between the 5th and 10th centuries. I love them for their history and their beauty; you hang them on the wall like a painting. They’re to be admired. But I do have a favorite rug that I’ve owned. I once went to Florida to buy a rug owned by Rudolph Valentino. He was a big movie star in the 20s, a big ladies man; all the women thought he was so handsome. His rug was beautiful, and all around the border was the writings of Omar Khayyám. That was my favorite rug I’ve ever owned. What about the rugs you sell at Ahdoot? Where do they come from? We travel around the world to find the best rugs made by the most practiced hands. Whether that’s here in New York, in Russia or China, or in Egypt, our rugs are made with the highest-quality fabrics and sourced from historic regions. Finally, why did you found Ahdoot? What is it about a rug that captivates you? I love them not only because they’re beautiful, but because of the history. Every rug was made by someone, every piece has its own history, and I find that fascinating. That someone made these rugs from hand so long ago and we still have them today—it goes back to what I was saying about Coptic textiles. They’re gorgeous objects, but they’re made by people, almost always by hand, and in that way I believe that Oriental rugs bring us all closer together culturally as a people.